As a result of a pesky knee injury at the hands of Bidean nam Bian, my forays north have been few and far between lately. It’s five months since I last climbed a highland hill and because such trips form the mainstay of my articles for Walkhighlands, I admit I started to worry where my next piece would come from. Thankfully, there is a wonderful phenomenon in the writing world where inspiration hits you when you least expect it. Usually when you need it most, and often it’s from the most unlikely of places. In this instance….the cold, clinical, rain-soaked concrete landscape squeezed between two car parks at St John’s Hill in Edinburgh. I could almost feel my spine tingle. I was already familiar with those words but here their isolation and prominence on a wedge of sandstone bestowed them with added weight and significance. In that short but stirring sentence Hutton was describing our planet’s exquisite ability to reshape itself: to grind entire continents to dust, to build massive mountain ranges, of being locked into an endless cycle of destruction and construction. It’s a general view of the Earth that most secondary school kids would today recognise. But in Hutton’s day, such a statement was almost as earth shattering as the very forces he sought to explain. In the mid 18th Century, geology as a scientific discipline had yet to be formally recognised but the study of the Earth was nothing new. The ancient Greeks devoted considerable time to pondering it some 2000 years earlier and, as early as the 11th Century, a Chinese statesman and scientist called Shen Kuo was writing about the effects of erosion on the landscape. More recently in 1669, Nicolas Steno, a Dane with an unlikely resumé listing both ‘scientist’ and ‘bishop’ as his work experience, was among the first to suggest that rock layers (or ‘strata’) must have been laid down chronologically, one on top of the other. So the mid 18th Century was hardly the dark ages. But while scientists and theologians understood the mineral composition of rocks, and recognised that they had somehow accumulated across the globe to great depths, the issue they struggled with was exactly where those rocks had come from? Whoever found the answer would inadvertently be on their way to delivering an estimation of the Earth’s age. At the time, it was widely held that the Earth was around 6000 years old, based on a literal reading of the Bible. The prevailing school of thought sought answers in the oceans, and as a result its advocates were referred to as Neptunists, after the Roman god of the sea. The most prolific of these was Abraham Gottlob Werner, a key figure in the mining industry in Saxony, who believed that all the rocks of the world had formed from water – minerals held in solution in vast primordial oceans had, he argued, ‘precipitated’ out of it as rock. Much like salt does from a lake. 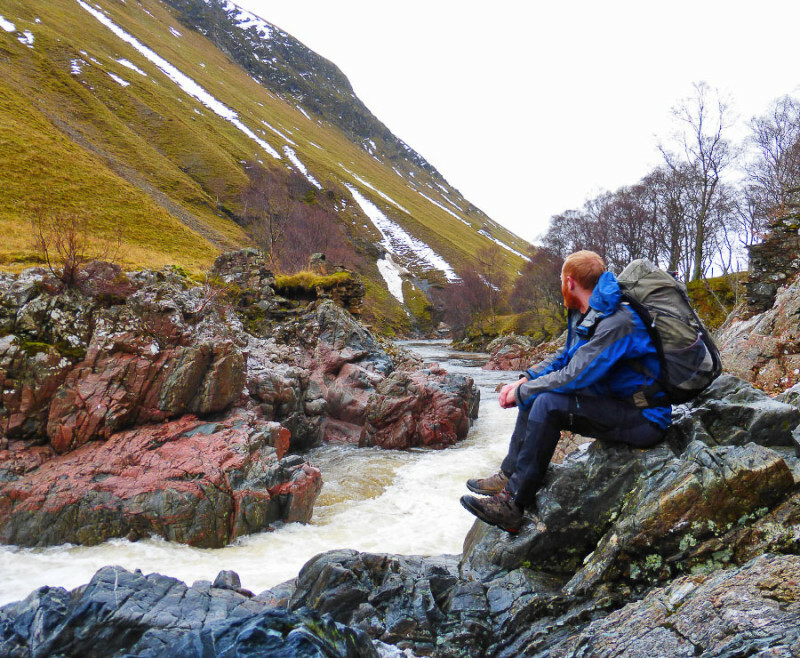 Contemplating life, the universe and everything rocky at Dail-an-eas in Glen Tilt. A truly historic location. He concluded that the oldest layers of rock (and in particular, granite) were at the bottom of any sequence, with progressively younger rocks on top. The great folds and contortions exposed in some rock layers on cliff faces were believed to be a result of the turbulent nature of the oceans. When the waters had receded, the landforms were revealed…..although no convincing explanation was given for where all that water had gone. All in all, it was a world view not entirely inconsistent with the central biblical premise of there having been a great flood in the distant past. Not everyone agreed, namely the ‘Plutonists’, named after the ruler of the Underworld, who saw the Earth’s landforms as being borne of fire rather than water. Anton Lazzaro Moro, an Italian abbot studying volcanic islands and, in particular the emergence of a new volcanic island near Santorini in 1707, recognised the upheaval that underground heat could produce. He saw volcanism as the key mountain builder, and lava flows and ash as forming the subsequent layers of rock on top. Werner did incorporate volcanoes into his work but he saw them only as localised, more recent phenomena that were ejecting molten sedimentary rock from coal beds burning underground. Both Neptunism and Plutonism contained elements of the truth but they needed someone to bring it all together. 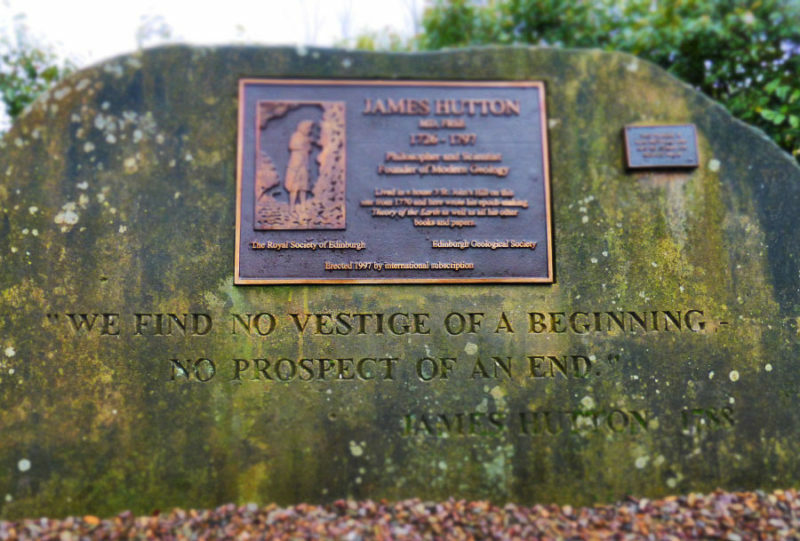 Enter James Hutton. Today we’d call Hutton a geologist but in his day he was a chemist, a doctor, a scientist and a farmer. Born in Edinburgh in 1726 he led a varied and distinguished life in Europe before inheriting his father’s farms in Berwickshire. 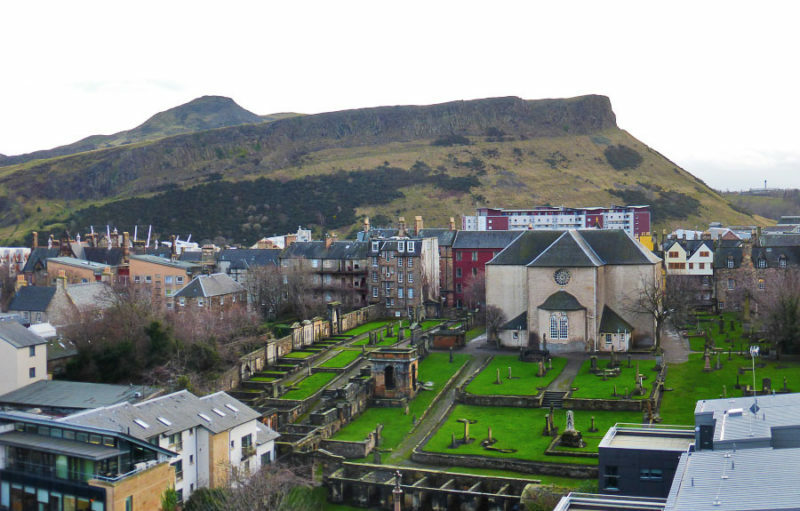 In 1768, after 14 years of farming, he moved back to Edinburgh and made his home on the site of the now memorial garden. There he formulated his theories on some knotty problems, not least how most of the substances found in rock were not soluble, ie they didn’t dissolve in water. That being the case, how could all the rock in the world have precipitated out of water? Hmm…. Hutton came down on the Plutonist side of the debate but he disagreed that all rock was of purely volcanic origin. He agreed with Neptunists that some rocks had been formed from sediments, but he disagreed about how those sediments were fused together. He postulated that molten rock was found way beyond the localised innards of volcanoes, and believed it was heat and pressure that ultimately fused the minerals of sedimentary rock together, not precipitation. Back in the present, in the memorial garden, I was staring at that evidence. 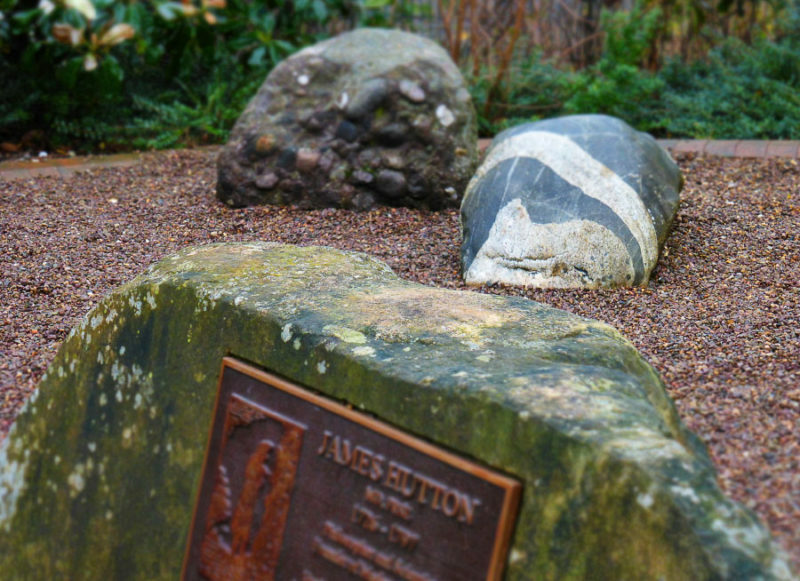 Four boulders sat behind the plaque, one of them dark grey with white bands around it, cut by finer white veins. A key at the garden entrance explained it was from Glen Tilt……perhaps my favourite and most visited glen in Scotland. I reached down and touched the smooth, wet rock. It was the next best thing to actually being there in the Cairngorms. A piece of Glen Tilt there for me to actually touch, to feel connected to. Partly out of longing for highland scenery and partly out of inspiration by the words before me, I suddenly felt motivated to pay my own visit, so the next day I drove to Blair Atholl and biked up the glen. My knee would hopefully be okay with that. A piece of Glen Tilt in Edinburgh – a boulder with intrusive white granite veins. I pedalled slowly up the estate track, following the course of the Tilt as it wound its way northeastwards. Hutton made this very journey in 1785 on his way to Forest Lodge. He knew what he was looking for, and he found it at the now ruined Dail-an-eas bridge. Here, the otherwise uniform flow of the Tilt is interrupted by a convoluted chasm. Water surges between striking rock formations in suitably noisy fashion, and on the day I visited it was thunderous. I found a perch among the jumble of rocks and, as the torrent roared behind me, I pondered whether James Hutton had perhaps sat in this exact spot. After all, everyone loves a waterfall. Hopefully Hutton was equally taken aback, but what he was really interested in were the streaks of white and pink that are visibly intruding into much of the rock here – ‘veins’ of granite like the ones on the garden boulder. He deduced that the only way granite could ‘intrude’ into another rock was if it was molten, had forced its way up from the fiery depths, had come up against existing rock above, and had penetrated any weaknesses in that rock before cooling and solidifying as granite. In fact, far from being a localised phenomenon confined to volcanoes, Hutton suggested that molten rock was forever being forced upwards from below. Some of it might reach the surface and form volcanoes, but where its upward motion was hindered by an underground obstacle it would exploit horizontal weaknesses between layers. Like piping jam into a sandwich. Hutton cited Salisbury Crags, a stone’s throw from his house in Edinburgh, as physical evidence of this. And you can still see it today, just around the corner from the start of the tourist stairs up Arthur’s Seat on a stretch of the crags called ‘Hutton’s Section’. Here, the vertical face of Salisbury Crags is the volcanic ‘jam’ in a huge sandstone sandwich. The upper layer of sandstone (ie the top piece of bread) that would have been found atop the crags has long since been eroded away by ice ages and weathering. But the bottom layer is still there to be seen, and you can actually see how, as the molten rock was forced between the two layers of sandstone, it heated them up, caught parts of the sandstone as it moved horizontally along and started to bend it backwards. Today it’s a remarkable geological snapshot, like a 320 million year old photograph. These mightn’t sound like major revelations but they turned Neptunism on its head. Neptunists believed granite was the oldest rock, first to be laid down as sediment in an ocean, but Hutton showed how granite could be younger than other rocks and that it wasn’t sedimentary at all. It was volcanic in origin. Molten. Hutton’s discovery inevitably meant that a sequence of layers in a cross section of rock strata wasn’t necessarily going to be in chronological order from bottom to top. Indeed, Salisbury Crags formed millions of years AFTER the sandstone layers into which it intruded were laid down. Substantial as those individual revelations were, collectively they would reinforce Hutton’s larger theory about the Earth’s inner workings that he presented to the Royal Society in Edinburgh in 1785. 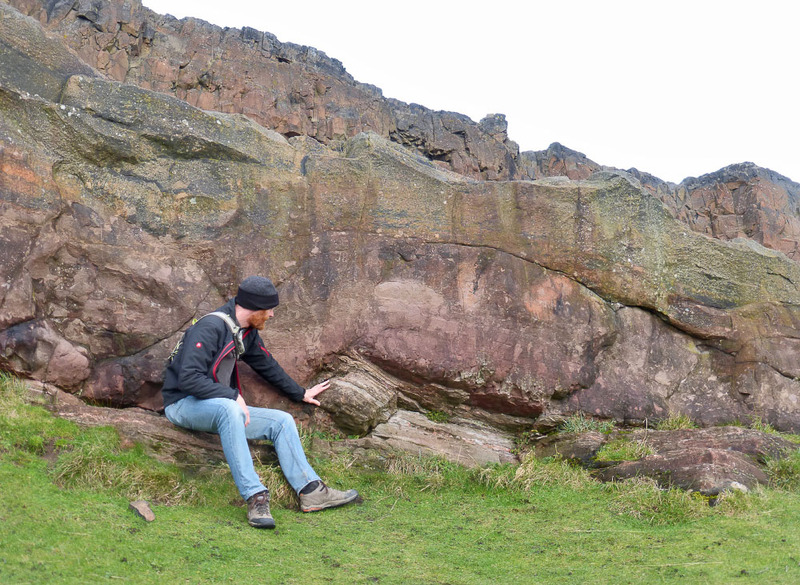 Hutton’s Section in Edinburgh – a 320 million yr old snapshot of sandstone being ripped upwards as molten rock passed over it. He envisaged a great unending cycle of creation and destruction – of whole continents being eroded down to sediment, of sediment being deposited at the bottom of oceans and then being compacted into new rock by both heat and pressure (rather than precipitation), and of enormous forces uplifting new material from below to replace what had been lost from above. A gargantuan cycle of erosion, deposition and uplift. Crucially, while many of Hutton’s Neptunist contemporaries saw the Earth as a static and unchanging historic record of past events, Hutton saw his cycle as something that never ceased. The very same processes that had shaped the world in the past were doing so now, in exactly the same way. After Hutton’s death in 1797, his theory therefore came to be known as the nine-syllable mouthful, ‘Uniformitarianism’- a reference to the fact that the processes were uniform over time. It was understandably controversial, but in time it came to form the basis of modern geology. As to the age of the Earth, well…..as far as I’m aware Hutton didn’t even try to put a figure on it. But the fact that it was all happening at an almost imperceptible pace led him to conclude that the world was very, VERY old indeed. Much older than anyone had previously thought. Infinite, even. Our best estimate today is 4.6 billion years which, in a world where we can barely remember what we were doing last week, is an inconceivably long time. So too is five months away from the hills for someone who lives for such things. It has felt like forever, but there’s nothing like an afternoon walking in James Hutton’s footsteps to put things into perspective. And hopefully, where my physio is concerned, there is indeed a prospect of an end.